There is no other occasion so important in any woman’s life as her marriage, to own all the splendid jewellery. It is more so for an Indian woman. Every Indian Bride desires to look elegant, stunning, and well-groomed from head to toe on the most awaited and memorable moment of her life/ The Indian bride looks so splendid in her dazzling jewellery sets teamed up with her exclusive bridal clothing. Bridal jewellery accentuates the overall appearance of the bride on her D-day and should be carefully chosen. 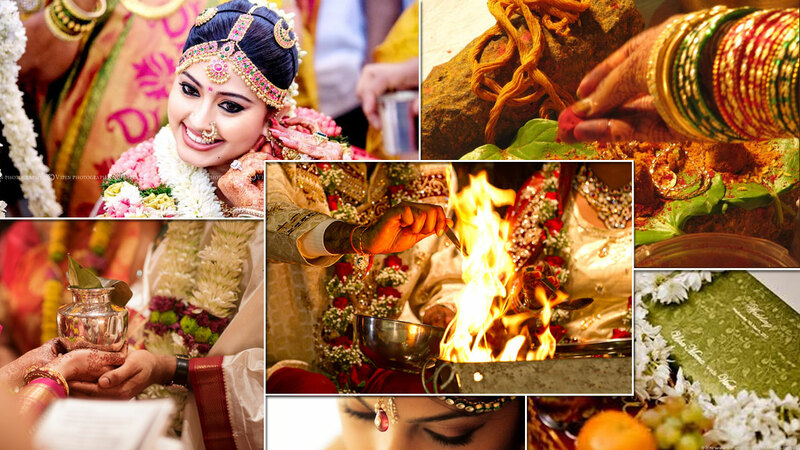 In India we have many pre-wedding ceremonies such as the Engagement, Sangeet, Haldi ceremony, Mehendi ceremony, Tilak, Janavasam and many more, depending on the family tradition. Each ceremony has its own importance and the bride looks no less than a princess with all her adorned attire and sparkling precious jewellery. 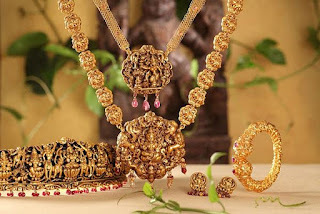 The South Indian Bride is beautified from head to toe with bridal jewellery which comprises Maang Tika, Jhumkas, 2-3 Layer Necklaces, Bangles, Armlets, Saree Waist Belt, Anklets and Toe Rings. It is incomplete without the mention of Mango necklace (maanga maalai) south Indian bridal jewellery sets. With an elaborately engraved centrepiece, studded with pink and green stones and gorgeous golden embellishments, this necklace will remind you of the brides of yesteryear. The variety of designs available for the Mango necklace will astound your bridal imagination. Temple jewellery gives the bride a divine and exquisite look. The antique finish layered chains of gold balls, colored beads and Nakshi work is all set to give the bride a million dollar appearance. The Goddess pendants studded with precious gem stones, uncut diamonds, polkis, nakshi balls or south sea pearls are trending since this jewellery looks heavy and gives the bride an opulently traditional appearance. Nakshi waist belts or vaddanams are very popular to flaunt the overall bridal appearance. The favorite design for pendants is that of Lord Ganesha and Goddess Lakshmi. A traditional feature of the South Indian trousseau, you see, the selling point of the Kasi necklace are the gold coins engraved with Goddess Lakshmi’s portrait, symbolic in the most common association of prosperity with the deity. A matching set of earrings complete this fantastic set, for an elegantly traditional bridal profile. Gutta Pusalu haram is a famous South Indian traditional design with heavy bunches of beautifully adorned small pearls, clustered along an antique gold chain. 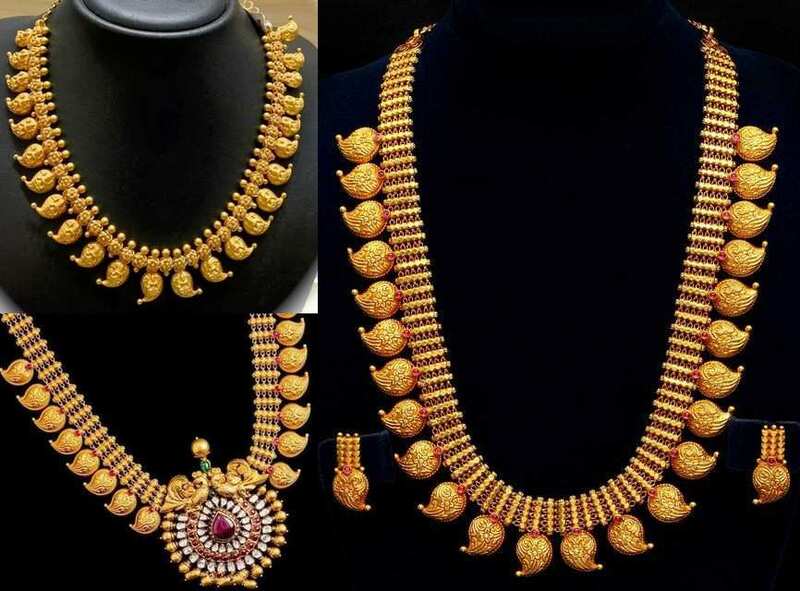 The Gutta pusalu haram or necklace is usually studded with rich rubies, emeralds or kundans and looks very graceful which are why it has become a trendy choice for today’s brides. Some of the Gutta pusalu necklaces come in reversible models with different colored stones studded on both sides. This stunning gold haram bridal necklace is a beauty to behold. The multiple strings of gold held together by stone-studded clasps, form a relatively long necklace. The centerpiece of this gold necklace is simply gorgeous. 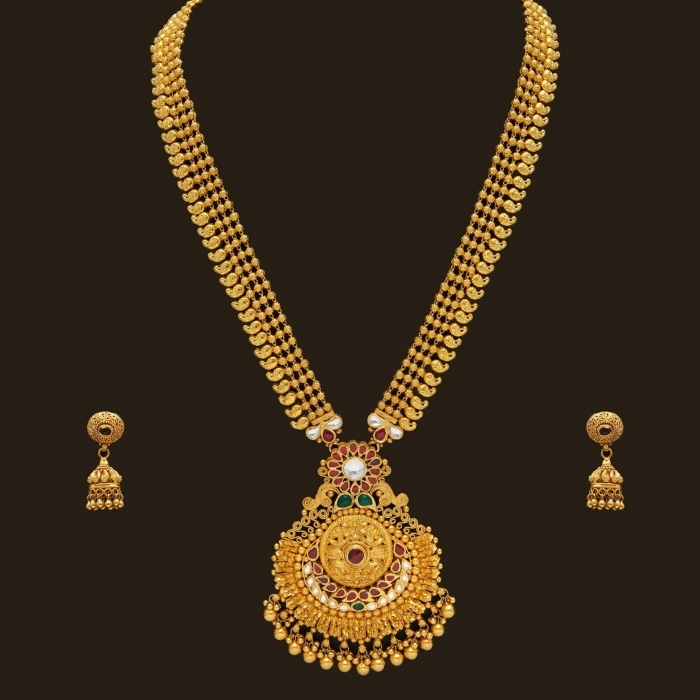 This can complement the overall rich south Indian bridal look with a sophisticated jewellery profile. If diamond south Indian bridal jewellery sets can be simplistic, they can also be suave and sophisticated. 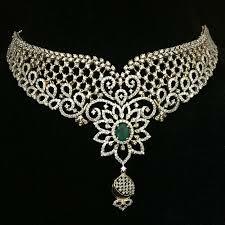 What has been done with diamonds in this choker alongside the central emerald and pearls is craft. 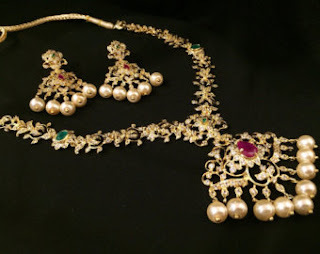 This beautiful set would rest beautifully on the South Indian bride. You could complement this look with a pair of double-jhumki studded with pearls or diamonds. A beautiful assortment of an intricate choker or uniquely designed necklaces and harams of different lengths creates a luxurious appearance for the brides.We have listed just few jewellery for neck and yet more is there for head to toe of a bride. A matching Mathapatti paired with an ornate piece of Maang Tikka is essential to highlight the bride’s forehead which makes her look like a princess. Richly designed jhumkas, gold bangles, vaddanam(waist belt), vanki(armlet), anklets and rings complete the overall bridal look. On wearing all this bride will look like a princess. Disclaimer: All the images used in this article are for just references only. If you have any concerns,we are ready to remove it.The celebrities in no way promote or endorse the brand.